Giraffe wear was founded by Andrew Ainge. With extensive experience in the field of photo personalisation and a sportsman involved with both a road cycle club and UK Triathlon club – Giraffe was born. Most people will have seen products like this before. The retail market is dominated by BUFF and they offer a great range of products. Andrew has a selection of BUFF headwear that he uses himself when doing triathlons and road racing. However, Giraffe products are all bespoke. Each garment is unique. The images and information on each garment can be totally different. Not only that, you can design your own. So if you want your own style – just create it. Andrew Ainge, founder of Giraffe commissioned ID Creations to create a logo design for his new brand. It was essential to create a logo mark that could be easily identified without the wording. ID Creations created various design concepts for the new brand from which a final logo was selected. The brand has a youthful, fun identity and combines the letter ‘g’ with the features of a giraffe’s horns, ears and tail. 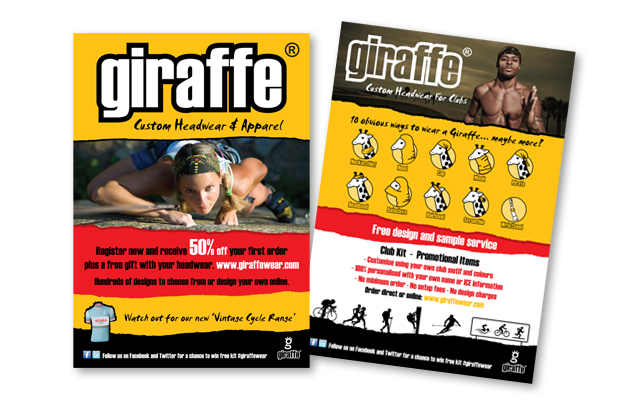 ID Creations has created various other elements for the Giraffe brand, including packaging and leaflets. 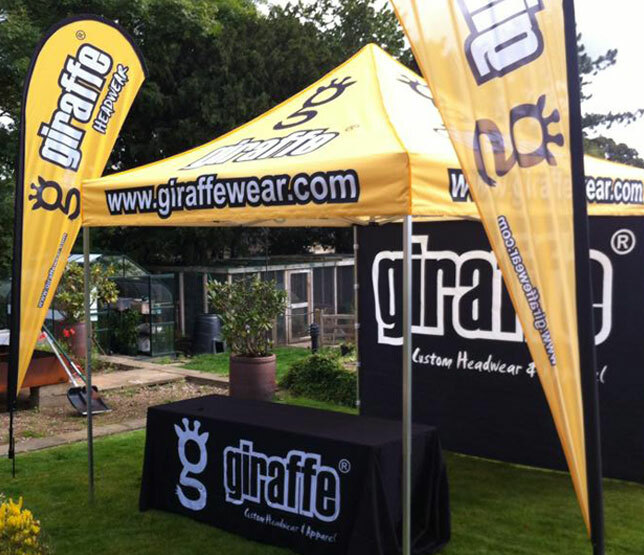 Graphics were produced for a tent and sail banners for various events, including the Big Bike Bash which Giraffe are a sponsor.